In a Nutshell: In less than three years, Rocket Mortgage by Quicken Loans has grown from an idea to a key factor in the climb to the largest home lender in America. Quicken Loans originated $25 billion in mortgages in the fourth quarter of 2017 to overtake Wells Fargo for the top spot among the nation’s 30,000 home lenders. The company claims mortgage or home refinance loan applications can be completed in less than 10 minutes, with a preapproval letter generated instantly. The company’s 30-day application-to-closing average beats the national average of 45 days, with some refinance loans through Rocket Mortgage closing in as little as eight days. As the company continues its rapid growth, it processes a new loan application, on average, every nine minutes. The last time I applied for a mortgage, the process was slow, cumbersome, and at times confusing. The amount of paperwork the lender required burned through two full black ink cartridges on my home printer. By the time I finally got the keys to my new home, all I wanted to do was nap away the mental and physical exhaustion induced by the process. Many Americans who consider the undertaking choose to sit on the sidelines and out of the housing market, either because they think they won’t qualify to buy a home or simply because they don’t understand the process. In 2015, Quicken Loans launched Rocket Mortgage as its online interface for home mortgage and refinance loans. Building a complex system that makes life easier for clients took a little more than three years and 450 people, but the final product did for home loans what TurboTax did for tax preparation — it took a frustrating, long process and made it something that could be done in a matter of minutes. Quicken Loans provides options for nearly every product an offline lender offers, including fixed- and adjustable-rate home loans, mortgage refinancing, FHA, USDA, and VA loans. Early advertisements in the company’s initial $100 million ad campaign showed a young couple touring the home of their dreams while the wife filled out a Rocket Mortgage application on her cellphone. By the time the real estate agent finished her sales pitch, a preapproval letter was generated on the phone and the couple bought the house. 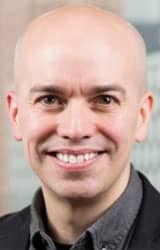 According to Regis Hadiaris, Rocket Mortgage Product Lead at Quicken Loans, the advertisement was based on an actual client experience. “We want clients to be able to apply for a mortgage while they’re waiting in line for a coffee,” Hadiaris said. At the time the ad was shown, the information was breaking news. Just days earlier, Detroit-based Quicken Loans announced it had originated $25 billion worth of mortgages in the fourth quarter of 2017 — enough to overtake Wells Fargo as the largest of the nation’s 30,000 home lenders. The originations give Quicken Loans and Rocket Mortgage a 6% market share in the ultracompetitive mortgage space. While the national average time to complete a mortgage from application to closing is around 45 days, Rocket Mortgage boasts that nearly all of its loans close in 30 days or less. The fastest of those applications close in as little as eight days for a refinance and 16 days for a new purchase. The ease of experience and top-notch customer service led to Quicken Loans winning the coveted J.D. Power award eight years in a row for client satisfaction in primary mortgage origination and four consecutive years for its customer satisfaction in mortgage servicing. “J.D. Power also studied our Rocket Mortgage clients and found they are, by far, the happiest clients in the industry,” Hadiaris said. The beauty of Rocket Mortgage’s online platform is it never closes. Hadiaris said that, on average, the company processes a new mortgage or refinance loan application every nine minutes, around the clock. An application typically takes less than 10 minutes to complete and can result in a preapproval letter at the end of the nine-step process. I recently had the opportunity to experience a refinance demo and found it to live up to everything the company promotes it to be — fast, easy, and educational. Refinance applicants start by choosing a priority for the new loan — anything from lowering monthly payments, taking money out of a home, or paying a loan off earlier. That information is used at the end of the process to determine the best options for the new loan. The system then walks the user through the process of inputting current mortgage and home information — a process made easier by Rocket Mortgage’s database, which the company claims is the largest in the industry. By inputting the address of the property, vital information like the type of property, most recent sales price, the year it was built, and more is automatically added to the application. The next step walks the applicant through the process of adding another applicant to the loan. Then comes asset verification, which is normally the most painful step for traditional applications, but fairly simple for Rocket Mortgage clients. Rocket Mortgage can import transaction data from more than 98% of the banking institutions in the US. Users can search for their institution, log in through their online account, and select which accounts to import data from. Rocket Mortgage applicants are required to complete a brief nine-step application. That information is used to verify funds and can be used to verify income and employment. Gone are the days of pulling six months worth of bank statements, collecting old W-2 forms, and printing numerous pages of tax information. Your printer will thank you. The digital asset verification tool is the fastest way in the industry to complete a normally painful task. The technology is something traditional lenders will eventually be forced to adopt if they are to compete with the growing popularity of online mortgages. After assets are verified, applicants answer a few standard federal government questions, run a credit report, and the automatic underwriting system scans the information and returns with a host of potential loan solutions. Applicants can search through multiple options that differ by interest rate, loan term, and closing costs, to find which suits them best. Some options require no money at closing. “We see clients using Rocket Mortgage to determine what they want to do. They get options completely based on their unique financial situation,” Hadiaris said. Hadiaris also stressed that applying for a new mortgage is a nearly identical process to the refinance experience, with the main difference coming at the beginning of the process when an applicant states his or her priorities. The entire Rocket Mortgage application process is designed to be as transparent as possible, which Hadiaris says differs greatly from the process adhered to by the company’s competition. Rocket Mortgage’s quick ascent to the top of the US home lender rankings shows that adoption of the online-only platform hasn’t been an issue. Statistics show that younger, millennial homebuyers are a large part of the company’s client base, but Hadiaris said that nearly every demographic has embraced the service. “Our experience is the fastest and most convenient way to buy or refinance a home,” he said. 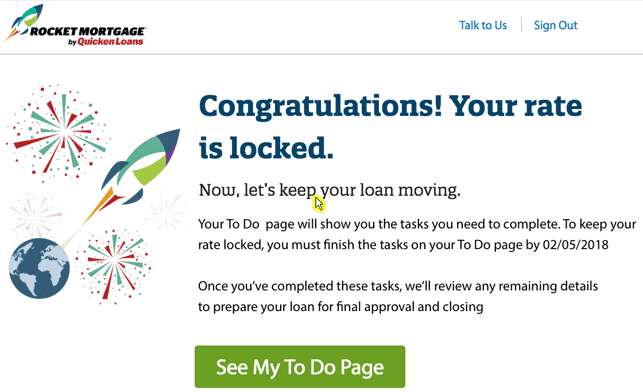 The company claims that just about any application for a new mortgage can be completed in 10 minutes or less, though the process doesn’t have to be that fast. Rate lock timeframes can vary for a number of reasons, but Quicken Loans is typically able to offer a rate lock for about 40 days. Throughout the entire application process, applicants have access to other instructional aids to help clarify and build their understanding of the process, including lists of frequently asked questions and videos. Applicants can also speak with a mortgage advisor anytime during the process by tapping the “Talk to Us” button on every Rocket Mortgage page. Rocket Mortgage took its technology and combined it with Quicken Loan’s lending infrastructure to create a home lending process that is simple, fast, and effective. 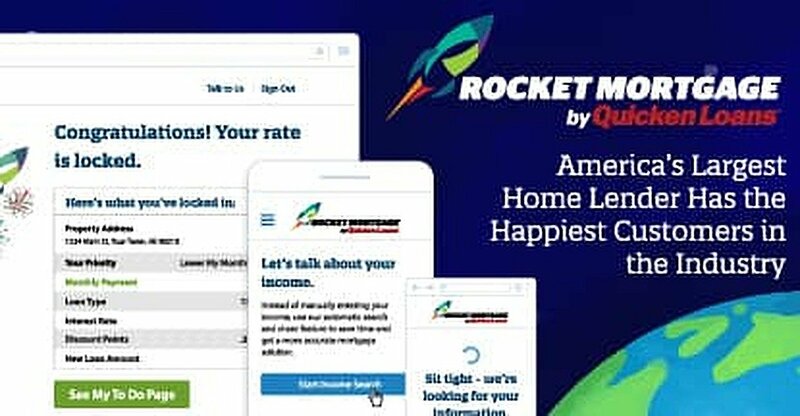 The popularity of the Rocket Mortgage online platform has helped Quicken Loans surpass Wells Fargo as America’s top home lender. Once loans are disbursed, the company changes hats and becomes an award-winning servicer of loans, with its customers being rated as the happiest in the industry. In Quicken Loan’s quest to make the home buying process as simple as possible, the company’s even introduced technologies like an Amazon Alexa skill where borrowers can tell Alexa to pay their mortgage and a payment is automatically generated from an account linked to Rocket Mortgage. Using the same award-winning underwriting standards as Quicken Loans, Rocket Mortgage gives users cutting-edge access to an array of loan options via a fully responsive website and mobile application that works on any screen and device. That dedication to client relations and a smooth home buying experience can be contributed to the motto Quicken Loans instills in each of its employees: Every client. Every time. No exceptions. No excuses.